The Mining Association of Nova Scotia held a news conference and mine tour on Tuesday at Pioneer Coal Prince Mine site as part of its Fuel Tax Fairness campaign. The goal of the campaign is to secure the fuel tax rebate the provincial government gives other resource industries for the mining and quarrying industries. “This was an opportunity to highlight our fuel tax rebate issue,” said Sean Kirby, executive director of the Mining Association of Nova Scotia. Kirby said the government gives other natural resource industries a tax rebate for fuel used in vehicles that don’t use public roads, such as fishing boats, farm tractors and off-highway forestry vehicles. He added that the government should treat all natural resource industries the same. Kirby noted that not having the rebate takes about $2.6 million away from the mining and quarrying industry. The Mining Association of Nova Scotia started a public relations campaign on the rebate issue in October. The association plans to continue the public relations campaign until the issue is resolved. Bill 99, tabled in the legislature on October 25 by Progressive Conservative MLA Alfie MacLeod, would give mining and quarrying the rebate. It’s not a new complaint. “It has been an ongoing effort ( for years),” said Jean-Baptiste Dromer, facility manager at the Windsor mine in Pugwash. More than a thousand feet beneath the ground, massive trucks and earthmovers ply the corridors of the Windsor salt mine in Pugwash. Mine operations want a fuel tax rebate – a rebate they say other resource industries receive, and a rebate miners receive in every other province. In an effort to draw more attention to the issue, the Mining Association of Nova Scotia took the unusual step of arranging a tour of the salt mine for reporters. More than a thousand feet below the surface, Dromer and association executive director Sean Kirby fielded questions about provincial fuel tax, which they believe should not be levied on fuel purchases to supply equipment that never drives on public roads. “We’re just asking the provincial government to treat mining fairly,” said Kirby. Kirby said industries such as farming and fishing receive a rebate on the tax. In every other province, according to the executive director, mining also receives a rebate. Nova Scotia is the exception. Large trucks rumbled past the small group of reporters and industry representatives. The massive vehicles were assembled below ground, according to staff. Each piece had to be lowered down the elevator shaft. And at the end of their lives, they’ll be taken apart below ground and hoisted back to the surface. Their roads are broad, gloomy salt-lined corridors far from streets or government maintenance crews. Kirby said three-quarters of what’s mined in Nova Scotia is aggregate. Much of what’s mined stays in the province and is used by other industries. He said the industry employs more than 6,000 people who receive the highest wages in the resource sector. “These are excellent jobs,” he said. Mining is a big employer in the province, he claimed, and helps create jobs in rural areas. You don’t pay property tax when you don’t own property, he argued. The association said both opposition parties support a rebate for mining. A rebate would take about $2.6 million out of public coffers, according to the industry. Government representatives were not immediately available for comment. NOVA SCOTIA’S MINING INDUSTRY went underground Tuesday in an attempt to shed more light on the fight for a fuel tax rebate. Officials offered reporters a rare tour of the Canadian Salt Co.’s Pugwash mine, the province’s only active underground operation, while discussing what they believe is the government’s unfair treatment of the industry. For years, fuel rebates have been offered to the fishing and agriculture industries for vehicles, such as boats and farm tractors, that don’t use public roads. No such deal exists for mining companies. “This is a long-standing issue for the mining industry,” said Sean Kirby, executive director of the Mining Association of Nova Scotia. The point of a fuel tax is that it is a user-pay system, said Kirby. It doesn’t make sense for the industry to pay the tax, which is meant to help maintain public roads, when vehicles such as haul trucks and excavators never drive on those roads. In Pugwash, the vehicles that help produce Windsor Salt don’t even drive on the Earth’s surface. The four loaders and five massive trucks, each tipping the scales at 40 tonnes, are sent down the mine shaft in pieces and assembled underground. At the end of their work life, they are returned to the surface in pieces. After years of trying to negotiate quietly, the industry is making a more public push, said Kirby. That fact is evident by Tuesday’s tour, something that is far from a regular occurrence. Nova Scotia is the only Canadian province to impose a fuel tax on the mining industry. Extending the rebate would return $2.6 million to operators, said Kirby, and help encourage job growth and development. Jean-Baptiste Dromer, facility manager in Pugwash, wouldn’t say exactly how much the mine would save with a rebate, but he said it would make a difference. In an industry that often deals with commodities with thin margins, every dollar counts. Having an added operating cost that competitors in other provinces don’t face creates yet another challenge, said Dromer. The Pugwash mine employs more than 200 people and dates back to the 1950s. 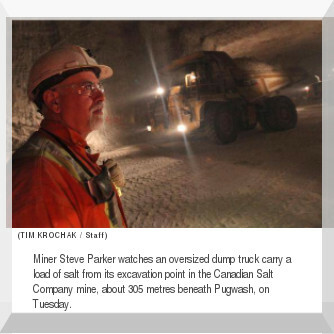 There are two eight-hour shifts each day at the mine, where workers ply their trade as much as 350 metres underground to produce Windsor Salt for, among other things, treating roads and seasoning meals. A layer of salt and other rock covers a smoothed down floor where the miners work. At a distance, it looks like sand and crunches like snow beneath one’s boots. At a closer glace, the salt that will grace steps and sidewalks everywhere in the coming months is clearly evident. Processing and packaging also happens at the Pugwash facility. Kirby said the industry continues to have discussions with the province. He said he believes the extension of the rebate to other industries is effectively admitting that the mining industry has an argument, but Kirby doesn’t know why the change hasn’t come. Natural Resources Minister Charlie Parker doesn’t know either. On Tuesday, Parker said he didn’t know why there is a tax on fuel used by mining vehicles but not those in other resource-based industries. “They make a reasonable argument,” he said of the mining lobby. An official with the Finance Department referred questions Tuesday to the Natural Resources Department. The Progressive Conservatives tabled a bill on the first day of the legislature’s fall sitting that would remove the fuel tax. The Liberals have also argued for the removal of the tax. Parker said the government must weigh what taxpayers can afford and what will promote economic development. Given that the provincial industry employs 6,300 people and generates $500 million each year, Kirby said the government can’t afford to overlook the potential damage the fuel tax creates. About 10,000 litres of fuel are burnt on a daily basis at the Pioneer Coal mining operation in Stellarton. The cost of filling the machines which carry tonnes of rocks is hefty and is the reason why the Mining Association of Nova Scotia and the owners of mine companies want to see their industry included in the list of those that get a tax rebate on fuel from the province. Their argument is that the gas tax is supposed to go to repairing roads and infrastructure, but the machinery they operate rarely touches public roads. Although it’s an issue they’ve talked about for years, this week Kirby is pushing the matter as he travels across the province as part of a public campaign to change the policy. Paul White, Vice President of Nova Construction which operates the Pioneer Coal mine in Stellarton said the rebate would make a huge difference to their operation. He said if they had the money back, they’d be able to invest it into their business and the people who work there. The amount of money involved in this is high though, which is why the province has been hesitant to sign a deal of this sort. Including mining in the fuel tax rebate would cost the government approximately $2.6 million per year. Pictou West MLA and Natural Resources Minister Charlie Parker said he’s heard the concerns from the mining industry for several years and understands where they’re coming from. He said the provincial government has passed a couple initiatives recently to help the mining industry, but this one is a tough decision that will have to be made largely by the Department of Finance. PLEASANT VALLEY - The manager of a local cement plant says it's time for the government to treat the mining industry in Nova Scotia equally with other provinces. 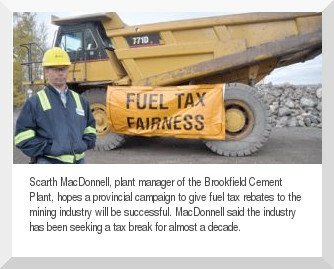 Scarth MacDonnell, plant manager of the Brookfield Cement Plant, which is a division of Lafarge Canada Inc., is pleased the Fuel Tax Fairness campaign has kicked off throughout Nova Scotia. The issue revolves around the fact the provincial fuel tax helps pay for public roads by charging vehicle owners who use them. Some natural resource industries receive a tax rebate for fuel used in vehicles that do not travel on public roads, such as fishing boats, farm tractors and off-highway forestry vehicles. However, the mining industry doesn't receive the rebate in Nova Scotia and industry representatives, such as MacDonnell, want that changed. "It's frustrating because the debate has been going on for 10 years," said MacDonnell on Tuesday from the Pleasant Valley-based plant. "I know there are so many (government) budget challenges but our prices are going up ... our energy - electricity and fuel - are the biggest cost. There are 12 Nova Scotia plants and we have the highest fuel taxes." MacDonnell said the plant's total energy bill in a year is more than $8 million. While he described the industry as "stable," and the Brookfield plant as "still profitable," he's "very concerned about anything that would erode that." He's hopeful the provincial campaign, which includes representatives from the Mining Association of Nova Scotia touring industry plants and talking to the media, public and MLAs, will make a difference. "The campaign has been successful in getting communication going. I'm hoping there will be some signal of optimism in February or March when the provincial budget comes," said MacDonnell. "If it's unsuccessful, we'll keep the dialogue going. We want some recognition that we're important so Nova Scotia has a level playing field. There are glaring inconsistencies and we need to keep pushing until something happens." Sean Kirby, executive director of Mining Association of Nova Scotia, said the fact Nova Scotia is the only province that doesn't receive the rebate in the industry is unfair for a few reasons. "The industry's vehicles don't go on public roads so we shouldn't be charged for using the public roads," said Kirby. "We are not licensed or even fit on those roads so it's unfair to tax us on it. They are taking millions of dollars away that could be spent on the industry, like the creation of jobs." Nova Scotia's mining and quarry industry provides 6,300 jobs and contributes $500 million to the province's economy annually. Nova Scotia’s mining industry launched a campaign for Fuel Tax Fairness this week to ask the provincial government to give mining the same fuel tax rebate it gives other resource industries. Fuel tax is supposed to help pay for public roads and highways by charging the vehicle owners who use them. The government gives other natural resource industries a tax rebate for fuel used in vehicles that do not go on public roads, such as fishing boats, farm tractors and off-highway forestry vehicles. Nova Scotia gives the rebate to fishing, farming and forestry, but is the only province that does not give it to mining. That isn’t fair. The government should treat all natural resource industries the same. Forestry, fishing and farming get the off-highway fuel tax rebate. The mining industry should get it too. It’s a matter of fairness. First, it makes mining in Nova Scotia more expensive compared to other provinces and hurts Nova Scotia’s mineral exports. Mining/quarrying is one of Nova Scotia’s leading export industries — the industry exports about one-third of its production to the United States each year, or about $105 million worth of minerals. However, we are losing sales because we are competing with mines in other provinces that have lower operating costs, such as those in New Brunswick and Quebec, because their provincial governments give them the fuel tax rebate. Second, it discourages mining companies from investing in Nova Scotia because this province is not seen as being supportive of the industry. Put simply, the fuel tax is a jobs killer. Including mining in the off-highway fuel tax rebate would “cost” the government only $2.6 million per year. But remember that this is money the government should not be taking from the industry in the first place because there is no policy reason to do so. 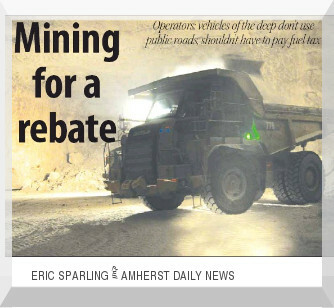 The rebate would apply to a range of vehicles that operate on mine sites, such as haul trucks and excavators, most of which never leave the mines and are not allowed to drive on public roads. The mining and quarrying industry is a key creator of jobs and prosperity for Nova Scotians. The industry provides 6,300 jobs, mostly in rural areas, and contributes $500 million to the province’s economy each year. Mining is the highest-paying natural resource industry and one of the highest-paying of all industries in the province. The industry’s total payroll is $96 million per year, most of it going into rural areas that are desperate for jobs. Mining today is a sophisticated, high-tech industry that is vital to our economy and way of life. Mining contributes to virtually everything in our daily lives that isn’t farmed, from houses to roads to playgrounds. The materials we take from the ground are the foundation of our modern society. The government of Nova Scotia should treat mining the same way it treats other resource industries. It should help all resource industries grow, create jobs and invest in the province. The government should give mining the fuel tax rebate. That would be fair. 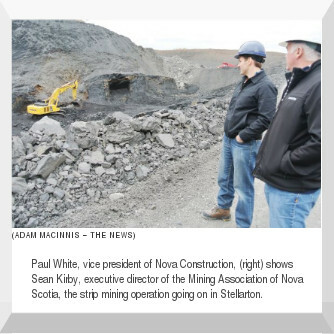 Sean Kirby is executive director, Mining Association of Nova Scotia. 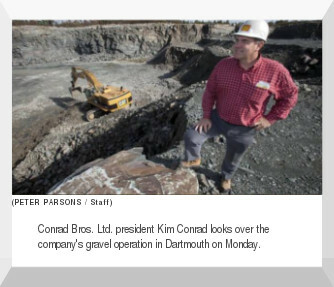 EACH WORKDAY morning, Conrad Bros. Ltd. president Kim Conrad oversees the firing up of one of the more powerful sets of heavy equipment in the province at the company’s Dartmouth quarry. “Over the years, we’ve implemented dozens of measures to enhance efficiency and protect the environment,” Conrad said Monday. 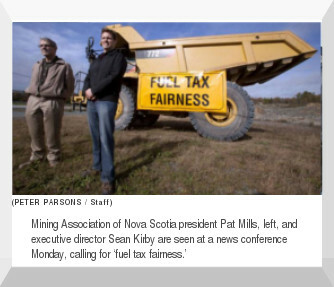 The Conrad Bros. quarry was the backdrop to the launch of a Fuel Tax Fairness campaign organized by the Mining Association of Nova Scotia, which says the 15 per cent provincial fuel tax adds up to an unfair $2.6-million tax upon the mining industry. “We’re just looking for fairness,” Conrad said during a tour of the quarry, just off Highway 107 near Waverley Road. Some of the biggest vehicles at the quarry — about a dozen of them — are used to excavate, load and transport rock used to build roads and highways. The big machines can consume between eight and 14 gallons of fuel an hour. “That loader over there could easily lift five of those Suburbans,” said Conrad, referring to the strength of a massive loader working near his parked sport utility vehicle. A massive off-road hauling truck was burnished with a banner calling for fuel tax fairness at the news conference. Mining association president Pat Mills said the vehicle, and others like it around the province, will spend its working life off-road. “Forestry, fishing and farming get the off-highway fuel tax rebate. The mining industry should get it too,” he said. There is a fuel tax exemption available to other resource industries for vehicles that do not go on provincial roads, such as fishing boats, farm tractors and off-road forestry vehicles. This adds up to a tax on the mining industry, said Sean Kirby, executive director of the Mining Association of Nova Scotia. Kirby said the industry will become more vocal about the issue this year. Kirby said Nova Scotia is the only Canadian province that refuses to provide the mining industry with a rebate on fuel taxes for off-road vehicles. Nova Scotians pay a provincial fuel tax at the pumps of 15.5 per cent per litre of gasoline, and 15.4 per cent per litre of diesel.